Distributor: Licensed in North America by FUNimation. Formerly licensed by ADV Films. 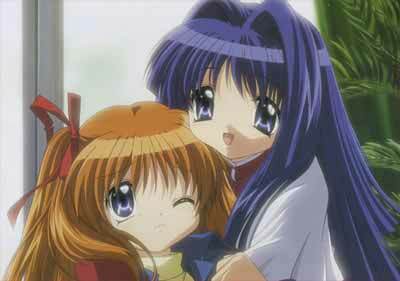 Also Recommended: AIR, Kanon (the original), the upcoming Clannad. Notes: Based on visual game by KEY. Aizawa Yuuichi returns to the city where he once spent his childhood. For some reason, he can scarcely remember a thing about it. However, the girls he meet seems to have something to do with his past and his memories, as does the magical aura that seems to linger around his person. Even though shows of this type generally don't tend to interest me much, this particular show had a lot going for it right from the start. Firstly, this anime is basically made by the same team that gave us AIR a few years ago. And, much like AIR, Kanon is based on a video game by Visual Art's/Key, who seems to have a knack for creating storylines that have a certain edge of tragedy around them. That time, I didn't expect AIR to be very good when we started watching it, but it was. It took perhaps the most MOE'ish character designs I had ever seen and actually created an involving story around them, one that, granted, kinda bombed near the end, but nevertheless took me completely by surprise. The second reason is that one of my colleagues, Jeremy Beard, have seen and done the review for the original version of Kanon. And, as he noted, the show did hold some promise, but sadly ended up being too short for its own good, amongst other minor flaws. Given that this new remake has twice the episode number along with greatly improved visuals can only mean that Kanon 2006 is better in every respect. And while I haven't watched the original, I trust my colleagues opinion by far enough to say that I am certain that this version of Kanon IS an improvement on the original by this magnitude. Not only that, but the viewers also has to deal with two of the characters, namely one Ayu and one Makoto, expressing their discomfort by utilizing onomatopoeticon that will throw viewers into diabetic shocks. "Ughuuu. ", Ayu mumbles each time Yuuichi chastises her. "Auuuu", Makoto whines when her prank plans fail, or when she too gets chastized. Couple that with the eyes you can see above here, and you got some hurdles to overcome. Once you do, however, you might be surprised to find that Kanon is a quite effective character-driven drama, where the characters and their personality traits and backstories gives Kanon its backbone. And they all have backstories that will be explained in, I assume, greater detail than the original Kanon. The first bonus in this show compared to similar shows come in the form of Yuuichi himself. He's surprisingly outspoken for a male romantic/harem lead, even snarky at times. In fact, he's fairly reminiscent of a certain Kyon from another wonderfully funny show I've watched. By no means is he a jerk, though, except perhaps when strictly necessary. The girls are... an interesting bunch, and it's mostly about them the show is centered. Most of them do share a past with Yuuichi that the show will explore in turn. On a positive note, very few of them share a romantic interest in Yuuichi, which allows the show to avoid falling into the same kind of haremish trappings that made Shuffle such a monumental piece of crap. Meetings and circumstances, as they were, are handled mostly through character interaction, with flashbacks filling in the blanks as the past is revealed more in detail. Add to that the subtle workings of supernatural elements, used to great effect in the backstories of those involved, and you got yourself a proper mystical drama. Make no mistake, though; Kanon is not always a happy story. Depending on your perspective regarding a lot of the scenes, tragedy plays a large role in how things end up, and Kanon will on more than one occation have you trying to force lumps in your throat back down again. It's a curious thing, too, seeing a scene where an incredibly strong desire paves the way for a miracle to happen, and the steep price to be paid for it is nonetheless what makes the first arc's conclusion so poignant, despite the several elements that would convince you otherwise at first glance of this show. Bear in mind that I generally don't like tragic shows, and that goes double for shows that are tragic for the sake of being tragic and also for the sake of coming off as artsy or just plain weird. Kanon is neither of these. Rather, Kanon makes use of the tragic or near-tragic elements in the show to make you appreciate the lighter moments even more. And, unlike AIR, at no point does Kanon jump the shark trying to be too big for its own britches with its ending. I am delighted to see that Kanon has been shown the same courtesy as AIR by being picked up for US release. It's been a compelling show from beginning to end, with very few dead spots (no pun intended.) 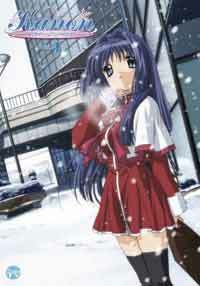 Having finished Kanon, Kyoto Animation has turned its eyes towards the next Visual Art's title, namely Clannad. And if I can expect the same lush animation and gorgeous art as in this show, along with the same strength of character, then I definitely will be looking into that as well. As it is, Kanon 2006 comes with my heartfelt recommendations. Look past the MOE design and the huge eyes, and look towards the story behind it. You'll be very glad you did. Recommended Audience: Much like the original, most of the concerns towards the audience should be placed on the occational dark themes in this show, which involves supernatural violence and mental/psychological situations, including suicide, or attempts at such. Other than that, this is a fairly clean show, and should be suitable for most teens.